1. Place an oven rack in the center position and preheat the oven to 350°F. Grease an 8½ x 12-inch rimmed baking sheet or two 12-cup nonstick minimuffin or petite four tins with removable bottoms. 2. In a bowl, combine 8 tablespoons of the butter with 1 cup of the flour until the mixture comes together to form a ball. Press the dough evenly into the pan. Bake for 15 minutes if using the baking pan, 10 to 12 if using the small cake tins. Remove from oven. Lower the temperature to 300°F. 3. Combine the remaining 2 tablespoons flour, the eggs, salt, vanilla, brown sugar, coconut, and pecans. Spread filling over the crust. Bake until lightly browned, about 20 minutes for the baking pan, 15 to 17 for the tins. Remove from the oven and cool in the baking pan or in the molds. 4. Melt the remaining 2 tablespoons butter. Whisk in the confectioners’ sugar and the orange and lemon juices. If using the baking pan, spread the glaze over the cookies, allow to set and then cut into squares. If using the molds, remove each when cool enough to handle and cool them completely on wire racks before glazing. 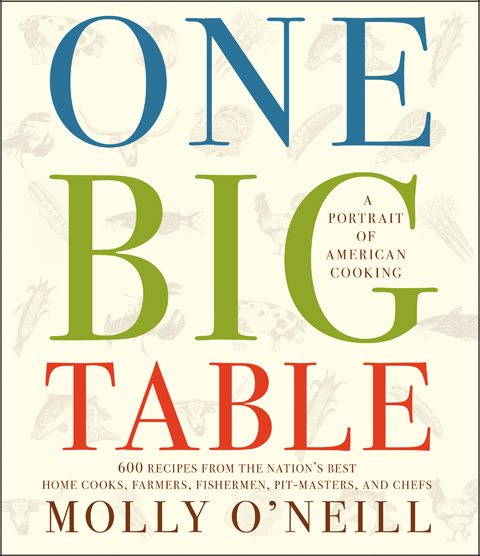 From One Big Table by Molly O’Neill (Simon & Schuster) Copyright Molly O’Neill 2010, available to purchase at Amazon.